I am experimenting and combining the easies of PlayMaker and the complexity of Antares. I started building SmartBlocks to allow access to PlayMaker's FSM within Antares. PlayMaker is already making my life much easier while I'm using Antares. It is much more complicated than PlayMaker. I didn't see any need at the moment to build PlayMaker Actions to access Antares programs, but if the need arises I'll do it. I won't post the code here because it is Antares side, so if you want the Smart Block, get the code here. If someone else here uses Antares and wants to share any ideas I'm all ears. Thanks! I gave Antares a go the other day, and I found the User Interface to be overly complicated to the point I couldn't really understand the work flow. It seems to have Unity's basic building blocks renamed for no reason other than the programmer making Antares thought it sounded better. Activators is a terrible name for events. The way to output data from one node to another, and basically always requiring the wire to go over/under the nodes seemed a little strange as well. Don't get me wrong, I'm not trying to bad mouth Antares here and start a flame war or anything like that. I think the underlying framework is great, but the way you interface with that framework seems to be overly complicated in my opinion. Anyone else using Antares have any suggestions or comments on it? I'd like to think it was just me not understanding the workflow properly. Yeas, the wire thing is a little annoying. That's why I use shotcuts for them most of the time. But the reason I use Antares is because it has a immense potential. In feel months there will be too many easy to use blocks that even artists will be able to use quickly. But Antares is better suited to big projects, most of the time its easier to simply code by hand some scripts if there's not many logic complexity. And PlayMaker is more for stuff I need to do quick and easy. A workflow using them together is my goal at the moment. I see great potential in both tools. I too found Antares too complicated and when I tried Playmaker it was the perfect fit for personally. I also believe that with time, Playmaker can become as powerful as Antares. As for the impact on framerate/cpu cycles... I don't know all this well enough technically to say. I think so too that playmaker can become very very powerful, tho I am not sure this would worth the trade and should replace all the coding aspect, conventional script still has the edge on any visual system still for some type of work and features. Currently, the concept is simple enough and to the point. I think it could win by allowing more visual tweaks, to give colors and visual differences and maybe some better workflow, grouping, and "wizardy" stuff. Cause right now, it's not what playmaker can not do that is itching, it's how the design workflow can be improved, and that holds a lot of potential. instead of becoming complex, playmaker should becomes more productive ( tho it's already SO productive already, don't get me wrong here, I mean simply improving). I would like to be proved wrong when I say that achieving a certain behavior through coding in Visual Studio + Resharper is easier/faster than with Antares, for just a bit more time dedicated to the learning curve. Of course I can't be proved anything 'coz I already got a decent foundation in C#, etc, but I'm just talking from a pure workflow point of view. PS. 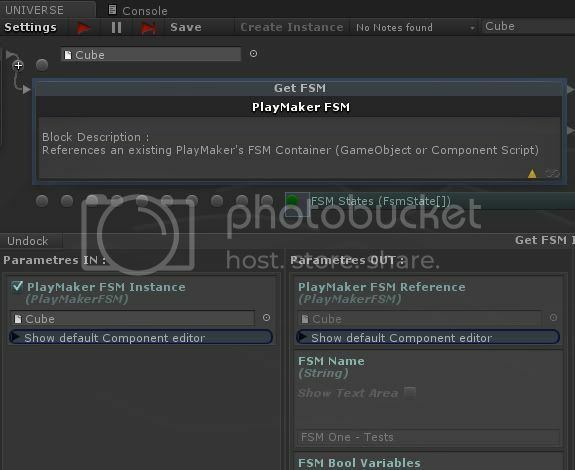 : Amazing for complete code-agnostics that is, I doubt I'd jump on the bandwagon with the ease of creation of new Playmaker actions through coding.